Amy Houts is an author of over 70 children’s books, cookbooks, and board games that feature early learning concepts, family themes of love and friendship, and holiday celebrations. Amy’s numerous short stories, articles, and poems have appeared in Ladybug Magazine, Highlights Hello, and American Profile Magazine. Her books include: Down on the Farm (Stone Arch); Think Like a Scientist (Pearson Learning Group); and Dora the Explorer Safety (Learning Horizons). Amy’s books and activities have won the Moonbean Children’s Book Award, Dr. Toy Best Vacation Children’s Product Award, Missouri Writers’ Guild Walter William Major Work Award, Creative Child Magazine “Seal of Excellence” Award, and more. Amy's background, as a children's librarian, preschool teacher, and features writer/reporter for the local newspaper, prepared her for a freelance career. Amy and her husband, Steve, have two grown daughters and three grandchildren. Born in New York, she moved to Missouri at age 10. Amy enjoys walking Gina, their Australian Shepherd mix, on the country roads near her Northwest Missouri home, an hour from Steve's family farm. You can often find Amy at home writing with Gina by her side. 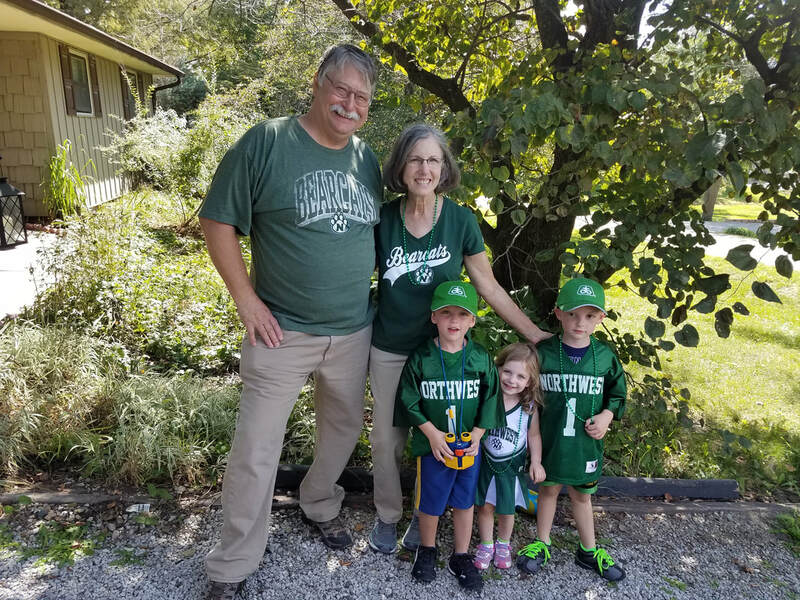 Steve, Amy, and their grandchildren, Toby, Charlotte, and Jake, are ready to attend the Northwest Missouri State University Bearcat f ootball game. "Amy, tonight I think I've read On The Farm to my 2-year old about 180 nights in a row. He won't go to bed without a full presentation, including voices, posing like Farmer Lyle and finishing the story with him pulling on his ear and saying, 'Baby' (the last word in the book). Just wanted to say thank you from a dad who loves to watch his son's face light up ... And it does from your book. Have a great night." “I have some news I want to share with you because I think my success story is also yours. You helped me a lot during the writing course to find my voice and to write about what I love. The big news is that I won the more prestigious children's book award held in Latin America called "Premio El Barco de Vapor.” I just wanted to say THANK YOU for all the inspiration, confidence, and tools you helped me with. I'm very happy I'm still working from home as a writer; it's been a blessing!" Amy Houts is a long-time member of the First United Methodist Church in Maryville, Missouri. As her pastor for the past 4 years, I have come to know observe and work with her in a variety of settings and have seen examples of her splendid writing. She is of the highest moral character, is quite intelligent and, as you can see in her work, knows her readership and can write for them in engaging, faithful and interesting ways. I commend her to you without the slightest reservation. "I am privileged to know Amy and have worked with her on several book projects. She is very knowledgeable about writing and publishing and has received numerous honors for her work. She is a very thoughtful, creative, and dependable writer. Her work gets done by deadline and it's a delight to work with her." "Amy is a pleasure to work with. She is a thorough professional who provides accurate, clear, original text and art specs written to guidelines and addresses pedagogical points smoothly and completely." "Thank you, again, for your timely and excellent work. These biographies can be really tough, especially when they’re in the 12,000-word range. But you did an excellent job of keeping the content diverse and showing the natural progression of Rachel Maddow's career. Your writing style progresses so logically, is expertly organized, and makes for an enjoyable manuscript to edit."